Nepal - Sagamartha Trek - 096 - Gokyo and Ngozumpa Gl in sunrise | Flickr - Photo Sharing! The dramatic landscape of the Gokyo region from the top of Gokyo Ri. We had hiked up in the early morning and I just caught the first rays of the sun as I reached the summit. 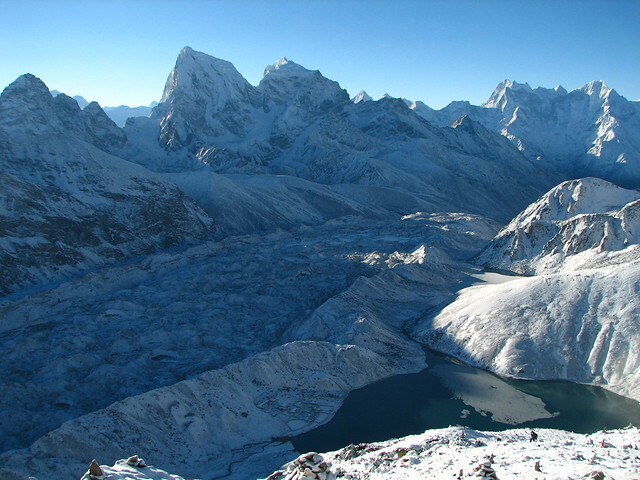 Visible are the Ngozumpa Glacier (the longest in Nepal), the mountains Arakam Tse and Cholatse and the village of Gokyo on the 3rd Gokyo Lake. We got snow the day before, so everything was a lovely fresh white. By late morning, much of the light ground cover was gone again (and then it snowed again). It was a brilliant morning and we could have stayed on the summit all day looking at the 360 degree panorama. landscapepicturist, Lidia Ilona, and 6 other people added this photo to their favorites. Thank you for sharing your photo!This photograph appears in a NowPublic news story: Freak Snow Storm Hits Nepal, Dozens Feared Killed. I've selected this photo as a Landscape Picture of the day at my Landscape Wallpapers Blog and the photo has been automatically set as wallpaper for the subscribed people.